The latest issue of our 44 page magazine was despatched to members on 21st October. I understand that due to the labour dispute at Canada Post, there is a backlog of mail, so Canadian members may experience additional delays before receiving their October 2011 magazine. 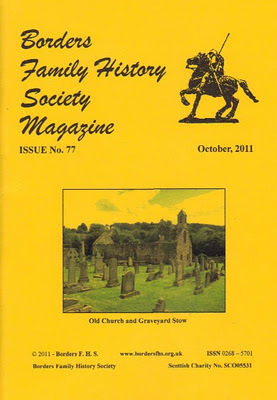 The cover shows part of the old ruined church and graveyard at Stow. The postal dispute is long over. The workers were legislated back to work at the end August. That's great news for our subscribers. The story is always interesting. Read accounts, histories and articles of how the events occurred, events that shaped the history of mankind or a small family, can let your imagination fly and think about how we would have acted in a certain time. Thank you, Part Time Jobs. If you, or anyone else, has a story that would interest our members please contact our Magazine Editor via our Contacts page.